Detroit hand holds with you to create workplace efficiency.We conducts short class room training followed by a Hands-on workshops in a pilot area.For sustainability we develop tool box topics for the shop floor.”Learning by action” principle brings improvements in the shop floor pre-defined for this purpose. 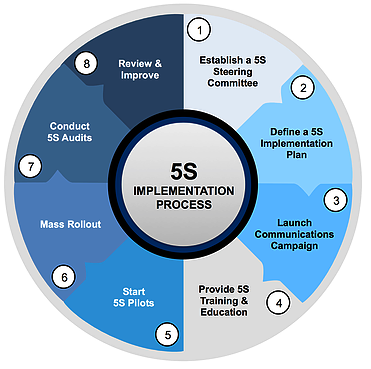 The team will be introduced to “5S”work efficiency model and will be abriefed with the tools of “5S” deployment. This will open the mindset of the team towards latest House Keeping practices and concepts. The team will be introduced with the tools of “5S” and its use for process efficiency. Through simulation the team will be explained the conventional House Keeping vs ” 5S” based House Keeping. This will be a consultancy programme focusing on the present Housekeeping culture and transition to “5S” based working.The tools of “5S” will be introduced and the team will be guided for independent execution.